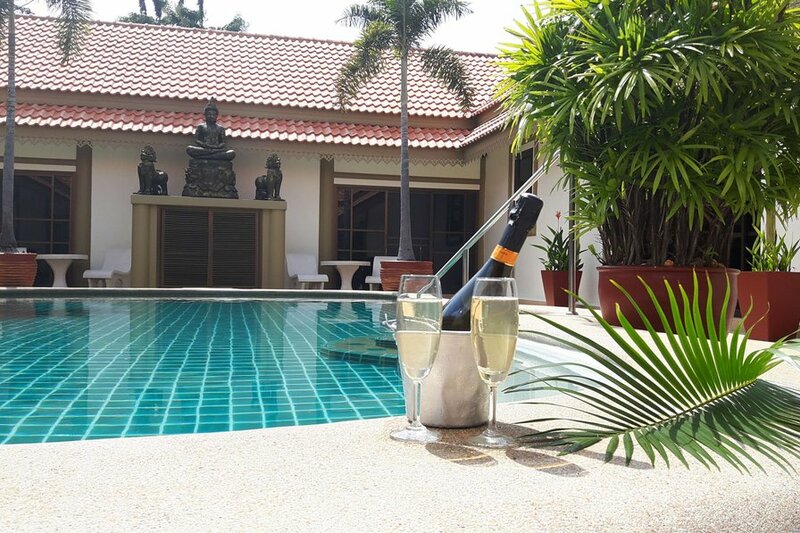 A beautiful 7 bedroom pool villa in set in a private courtyard .Centrally located for water parks,attractions and beaches.20 minutes from u-tapao airport.Located in bang sare Thailand. siam court is centrally located for Ramayana water park,cartoon amazone network water park,silverlake vineyard,nong nooch gardens beaches islands watersports,golf courses shopping ,major attractions,culture centres and much more.the villa is great for large family groups or groups of friends as all bedrooms have individual bathrooms ,entrances and facilities,fridges,tvs etc.Each room opens onto our beautiful pool.There are 2 fully equipped kitchens for guests and a BBQ.we have a vip mini bus and an open bus for groups transport to attractions etc.we pride ourselves in service to our clients and have won many awards for our villa.The villa is a five minute walk away from shops,bars and restaurants and is located in a quiet street.There are local markets within walking distance and bang saray beach. There are many water sports,and golf courses close by.Pattaya CitS is 20 minutes away for great bargain shopping.We have samasean island for wonderful snorkelling and many culture centres,temples,shows and places of interest to visit nearby.Siam court is a great location for family parties and BBQ.we can arrange small weddings of your choice and receptions held in the courtyard.Siam court is just 90 minutes from Bangkok airport ,90 minutes from koh samet.3 km from ocean marina,and has so much to offer your group.